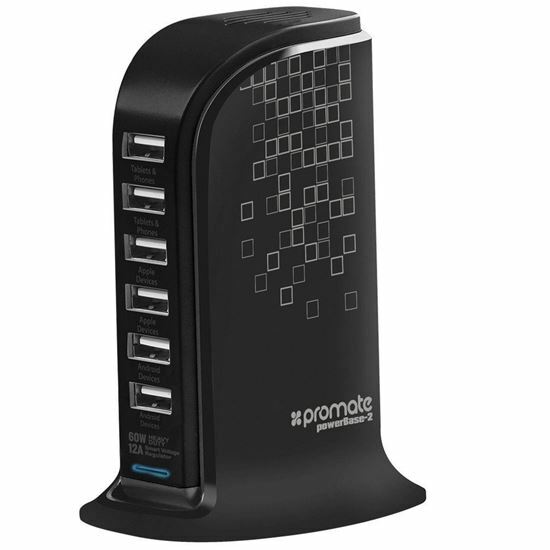 powerbase-2, a 12000mA ultra-fast charging power station with 6 USB ports that allows you to charge up to 6 devices simultaneously. It also features built in over voltage, over current and short-circuit protection. The Power switch lets you control output to the 6 ports. It is one ideal product for all those who multi-task and never want to run out of power on their devices. powerbase-2, suitable for both home and office, is an ideal solution to charge your devices easily and simultaneously. • Powerful 6 USB Charging Ports: 12000mA ultra-fast charging power station with 6 USB ports. • Smart IC Protection: powerBase-2 smart circuit design provides optimum protection against over-heating and over-current and Short-circuit. • Universal Power: powerBase is compatible with all USB-powered devices. • Multi Selection Interchangeable Plugs: Moreover, you can choose from multiple power plug options i.e. from US, EU, UK to AU Plug.